Real estate levels in 2010 appear to be either dropping or freezing nationwide during the usually active spring and summer months due to the wake of the 2007 housing crisis. But in Silicon Valley, where the characteristically warmer temperature seems to not only apply to the weather, the local real estate is making its way back from the extremes of a couple years ago. So from 2000 to the second quarter of 2010, where is the Silicon Valley housing market now? Pretty much where we started. Number of closed sales for single-family homes in Santa Clara County during the second quarter of 2010 are down 4% from the same period in 2000; and the average sales price is up 3%. The sales spikes we see every year are part of a natural market cycle that peaks in the spring and dips in the winter. Competition is greatest in the spring when the most inventory is available and the most prospective buyers are out looking. Sales numbers were negatively affected by the dot-com bubble burst in 2001 but shot back up once the housing bubble formed. What’s closest to buyers and sellers minds alike is the housing crisis that bottomed out in 2008. Silicon Valley’s strong economy (that some reports say is losing its edge) has meant a swifter recovery than the rest of the nation. If the economy continues its recovery, the housing market could return to a seller's market. But sales numbers are only one facet, where other areas of the market are still depressed. Average days on market (DOM) is less influenced quarter by quarter from natural market cycles compared to number of sales. Homes were being sold at record pace in 2000 and between 2004 to 2006. The two recessions in the last 10 years pushed DOM to above two months, even up to three. Though desirable homes in good neighborhoods will always sell quickly, the housing bubble inflated everything, which resulted in a flood of overpriced homes during the crisis and pushed DOM upward. Since low DOM numbers are attractive to buyers, they are sometimes falsified to make a house appear more attractive on the market. Or poor sales strategies can make an otherwise good home sit on the market for an extended period of time. So don’t let DOM be the final judgement when deciding on a house. But overall a low DOM is a good indicator of market health. Here we can see how big the housing bubble really was. With the dot-com bubble, money was focused in the stock market. But when that crashed, homes became “hot,” lending requirements loosened, and real estate became the new investment trend. The recession in 2001 dropped the average price for single-family homes 19% from its peak ($750,039) in the second quarter of 2000 to the low ($605,286) in the fourth quarter of 2001; compared to the 48% drop from the housing market bubble peak ($1,083,930) in the second quarter of 2007 to the low ($568,542) in the first quarter of 2009. 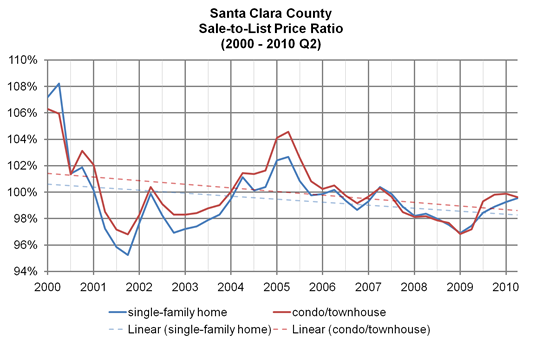 Currently, home prices in Santa Clara County are on the rebound and trending towards 2000 and 2004 numbers. Strong markets in smaller cities like Palo Alto and Los Altos faired much differently than the large city of San Jose because of a difference in demand and foreclosure rates. The ratio compares buyer and seller perceptions, where above 100% is a seller's market and below 100% is the opposite. The bubbles and crashes are clearly seen here but reflected in a much different way than what is seen in the average sales price graph. The boom in the early 2000s shows that buyers where much more willing to pay over listing price until the 2001 recession. The ratio later peaked again in 2005. Sellers priced their homes much higher during the real estate bubble but the ratio stayed near 100%, meaning buyers believed the inflated prices were worth the investment. In recession periods buyers are hesitant and sellers have to adjust their listing price. Today, the average listing price is increasing again with the ratio near 100%. The graphs above give a bird’s-eye view of the real estate market in Santa Clara County beginning to settle. Although it may be a very different perspective from an individual home buyer or seller, who could have gotten caught in either the bubble or the crash. The view can also be very different city to city, reflecting hyper-local markets, as we have seen in our second quarter 2010 analyses of Los Altos, Mountain View, Palo Alto, and Sunnyvale. The main idea of these graphs is to show that real estate markets, while unpredictable, are cyclical.